The war correspondent is the unsung hero of modern warfare in 5 Days of War, a highly fictionalised drama set during the 2008 war between Russia and Georgia. An emphasis must be placed heavily on ‘fictionalised’ though, because Renny Harlin’s (Die Hard 2, Cliffhanger) latest film plays more like propaganda than any attempt to accurately portray the complexities of the South Ossetia War. It is unapologetically slanted and sentimental, which is likely to leave the uninformed moviegoer confused as to where the line between fact and fiction lies. 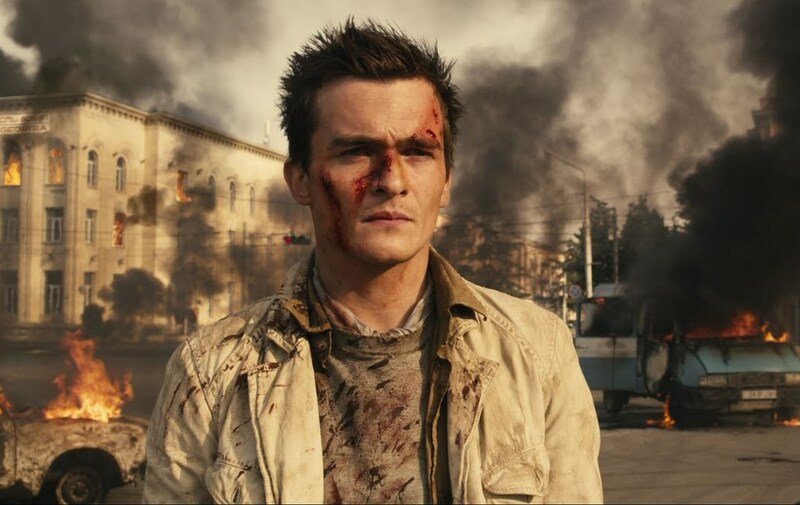 The film stars Rupert Friend (Pride and Prejudice, The Boy in the Striped Pajamas) as a talented but tormented war reporter who ships off to cover the brewing conflict; Emmanuelle Chriqui as his local love interest; an oddly cast but earnest Andy Garcia as the Georgian president; Val Kilmer as a seen-it-all veteran correspondent; and Dean Cain (yes, the guy from Lois and Clark), who has a few lines as a US press liaison. Heather Graham also has a cameo, but thankfully gets killed early enough into the fray that we don’t have to endure too much of her. But despite what can only be described as woeful miscasting and incredibly weak performances from the lead cast, 5 Days of War is ultimately sunk by the script, attributed to Mikko Alanne (who is also attached to Oliver Stone’s upcoming Vietnam War drama, Pinkville). Risibly simplistic in its notions of good and evil, and of what conduct constitutes heroism and what defines villainy, the film settles for easy irony instead of complex characterisation. It complains that CNN and other mainstream news channels unfairly present only one side of the story – and then proceeds to tell only the other side of the story, all the while claiming it as fact. Not at all surprising considering the film owes its initial funding to the Georgian government and lists a state minister as a producer. The combat, at least, looks good, with the military equipment reportedly provided by Georgia’s defence ministry. It makes good use of the hand held camera to evoke a more participatory response when watching it – there are moments when you really feel like you’re looking through the lens. But the rest of the film can’t convert this sense of engagement into delivering a tangible message; it is far more interested in its bland, underdeveloped fictional characters than in giving any sense of the scope of or motivations behind the war, which is shown from such a one-sided angle that it seems nonsensical – though Georgian President Mikheil Saakashvili would most likely disagree.